That is that it says front and center on the Rebuild Foundation website. And clearly, Theaster Gates, the founder of Rebuild, knows what he wants to do and gets it done. There are artist residences, movie houses and arts centers for people living in communities where such opportunities were not previously offered. 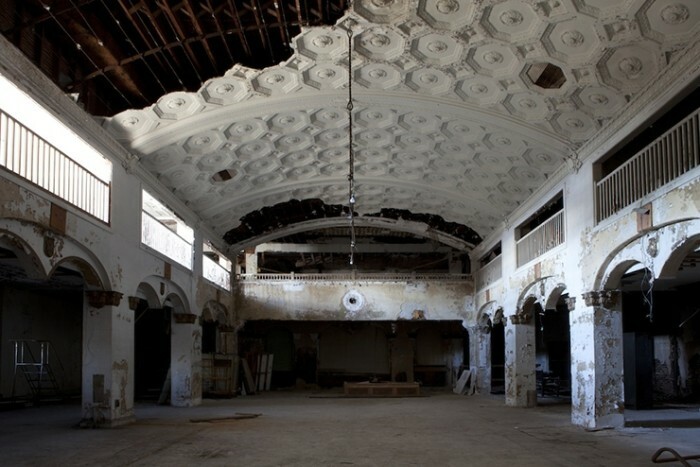 In October 2015, Rebuild will open the old Stony Island Bank into a cultural space as well. 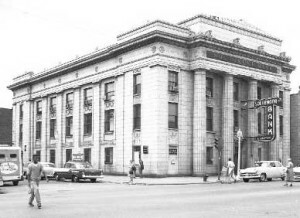 The building was a beauty back in the day, located at 6760 S. Stony Island Ave. in Chicago,it was designed by architect William Gibbons Uffendell. It was pretty glorious. With an arched ceiling with coffers, (coffers create a detailed waffle pattern that are imprinted into the ceiling,) the space is large and grand. But no one had used the space for many decades and the City of Chicago was about to demolish it, when Theaster Gates offered to buy it for ONE DOLLAR. He also agreed that it would be restored and a project of adaptive reuse. And now the Rebuild Foundation will unveil it as a new arts center, called the Stony Island Arts Bank, as an “arts repository for African American culture and history,” says Gates. We cannot wait to see it. Hope you will make it there too. More info can be found on The Spaces, and the old photo was taken by WayOutWardell which we found there.